Tejashwi Yadav accused Modi of being "a factory, manufacturer and distributor or lies"
In a display of Opposition unity ahead of the upcoming Lok Sabha elections, more than twenty national leaders across the country, assembled at Kolkata's Brigade Parade ground. 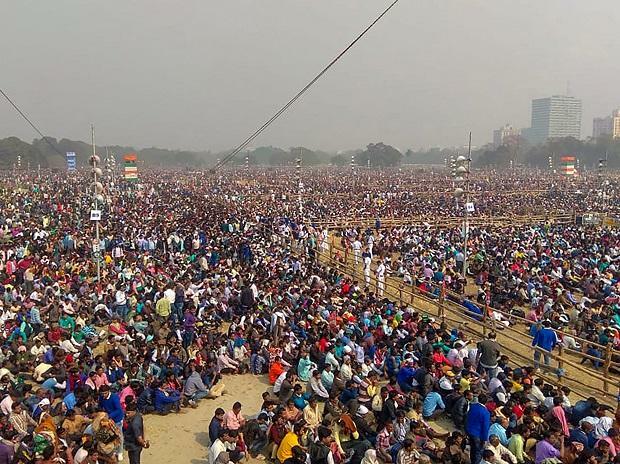 The Opposition Unity rally, moderated and organised by West Bengal chief minister Mamata Banerjee, witnessed millions of supporters. Some of the national leaders included three present chief ministers Arvind Kejriwal, Chandrababu Naidu and H D Kumaraswamy; and former chief ministers Farooq Abdullah, Omar Abdullah, Akhilesh Yadav and Gegong Apang attended the meeting. Gujarat MLA Jignesh Mevani, Patidar leader Hardik Patel, former BJP leaders Arun Shourie and Yashwant Sinha, Congress spokesperson Abhishek Singhvi, former J&K chief minister Farooq Abdullah, NCP's Sharad Pawar, former UP CM Akhilesh Yadav, Congress leader Mallikarjun Kharge and other political leaders unanimously urged parties to united forces against the Narendra Modi-led BJP in the upcoming Lok Sabha elections. Addressing the ‘United India’ rally, former J&K chief minister Farooq Abdullah called Electronic Voting Machines (EVM) 'chor' machines and said opposition leaders must urge the poll panel to do away with them. BJP rebel leader Shatrughan Sinha slammed Mogi government for implementing demonetisation in haste. He warned his party to come out clean on Rafale deal. "HAL was not given the contract to build aircraft. Please, come clean with facts on Rafael otherwise you will have to hear: Chowkidar Chor Hai, Chowkidar Chor Hai, Chowkidar Chor Hai," he said. RJD leader and son of Lalu Prasad Yadav, Tejashwi Yadav accused Modi of being a factory, manufacturer and distributor or lies". Mamata rally a 'failed front': BJP Asserting that it will form the next government under the leadership of Prime Minister Narendra Modi, the BJP called the United India Rally of the opposition in Kolkata as a "failed front" with full of "selfishness" and "contradictions" and raised questions as to who is their prime ministerial candidate. "The rally in Kolkata is a failed front. This front is made in a condition of hopelessness. The stage is full of selfishness. There has been personal hatred on this stage. This is the stage of contradiction and conflict," Rajiv Pratap Rudy said. The rally ends with the slogan "Badal do, badal do, Dilli mein sarkar badal do". Tyaag ka naam hai Hindu, Imaan ka naam hai Musalman, Pyaar ka naam hai Isaai, Sikhon ka naam hain balidaan. Yeh humara pyara Hindustan, says Mamata. 'Modi government has passed its expiry date': Mamata Banerjee West Bengal Chief Minister Mamata Banerjee: "Modi government has passed its expiry date. There are 22-23 parties here. Bengal has always shown the way. Taking a cue from Kejriwal's speech, in 70 years what Pakistan failed to achieve, Modi government has done it in four years. From demonetisation to GST, they have looted the country. He claims that he is only saint, let the government fall, you will realise. Their party offices are like shopping mall. Politics has a courtesy, there is a Lakshman rekha. You have spared none why should we spare you? They are changing everything - history, geography, constitution. There are no jobs and they are promising reservation. This brigade has seen historical rallies. Today's call from the brigade has come out of a historical necessity. Everybody should come together. Collective leadership is required. They ask who will lead us, there are so many leaders here. We will not think of who will be Prime Minister. We will decide that after the election. Similar rallies will be organised by Chandrababu Naidu, Arvind Kejriwal. If Farooq ji does a similar rally in Kashmir, if Tejwashi does it in Bihar, we will go. If people vote to BJP again, they will lose their deposits in banks." "BJP has two seats in West Bengal. They will lose that very soon. Just wait and see how our allies will do in the upcoming elections. I urge Hardik and Jinesh to keep moving ahead. There will be no achche din for BJP. I am not concerned about who becomes the PM, I just want BJP to go," says Mamata Banerjee during United India rally. "This meeting has been forced by historical necessity. You ask who's the leader of the Opposition. There are so many people on the stage. Can't you see? We have many leaders unlike your party," says Mamata Banerjee.